We are all learning to find our voices and we are all advocates for a cause, whether or not we realize it. So take up space, and raise your voice. If you don't know what to say, then sing, dance, or build something. Find a way to tell your story. Worldwide, there are over 62 million girls who do not have the chance to attend primary or secondary school. In the time it has taken you to read this sentence, a girl under 18 has been married. That means nearly 15 million early or forced child marriages each year. This week, the Women in the World Summit in New York is focusing on some of the biggest problems like these that we collectively face, and putting the spotlight on some of the most influential women in the world. 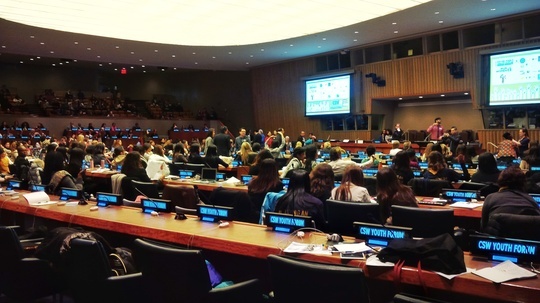 This week's event reminds me of my own recent experience in New York, attending the Youth Forum at the United Nations' (UN) 61st Commission on the Status of Women (CSW) last month. Joined by nearly 1,000 youth from 58 countries, I had the privilege of attending the Youth Forum with Plan International Canada. Together we learned about ways that youth can lead change in their communities at home and abroad to achieve gender equality -- and the other Sustainable Development Goals -- by 2030. Delegates participate in a session at the CSW61 Youth Forum. At the CSW Youth Forum, we heard from women and girls who are defying the odds and making their voices heard. Women like Malvika Iyer, a bomb blast survivor who, with both of her hands amputated, is completing her PhD studies in social work. 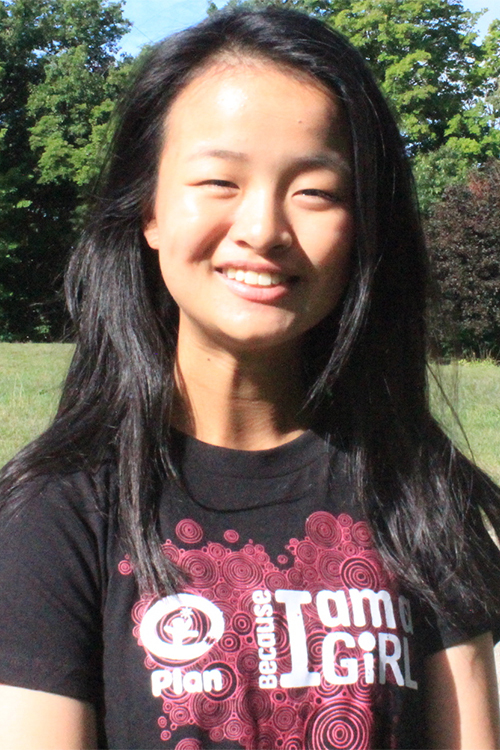 Women like Mengdi Wu, a young entrepreneur who designed a backpack to keep girls and their belongings safe. Or girls like 11 year-old Elizabeth who, while explaining why she stands for gender equality, likened love to a doughnut: sweet, enjoyable, and something to be shared with others, otherwise why is it in your hands? Through these conversations, we came to better understand the power that we, as youth, have to effect change for girls and women around the world. One of the most effective ways we can bring about that change is through advocacy. When it comes to advocacy, the word 'empower' comes up a lot, but what are the barriers that keep us from seizing power in the first place? For meaningful youth participation to happen, boys, girls, and young men and women must be involved in all levels of decision-making and governance -- beyond tokenism -- in order to shift social attitudes and norms and create an intergenerational dialogue. Even when that power is not easily accessible, Lakshmi Puri, Deputy Executive Director of UN Woman, urges youth to "demand it, transform it, and disrupt it." It's not enough to tell women and girls to feel empowered. Instead, let's act powerful. Because we are. Whether standing on stage at the UN or voicing your opinion in a classroom, it can be daunting to feel like you are representing an entire generation of youth in your actions and decisions. But being part of Plan International Canada's Youth Advisory Council has taught me the importance of speaking for yourself and owning your voice as a young leader in the community. We are all learning to find our voices and we are all advocates for a cause, whether or not we realize it. So take up space, and raise your voice. If you don't know what to say, then sing, dance, or build something. Find a way to tell your story. We have come a tremendous way in achieving a more equal world, yet women are still often thought of in association with family units rather than as individuals. Women have fewer opportunities to pursue their dreams because of tradition, a sense of obligation to those around them, and harmful gender stereotypes. Achieving gender equality by 2030 will take all of us, and progress on a global scale rarely arises from satisfaction. It arises from dissatisfaction. In order to reach our milestones, targets, and goals, we also need to remind ourselves of the underlying problem: inequality that shapes the lives of girls and women around the world. This is why it is important for youth to play an active role in keeping government accountable. Especially in times where there is a lack of effective response, youth need to take action. Plan International Canada CSW61 Youth Forum attendees in Times Square. 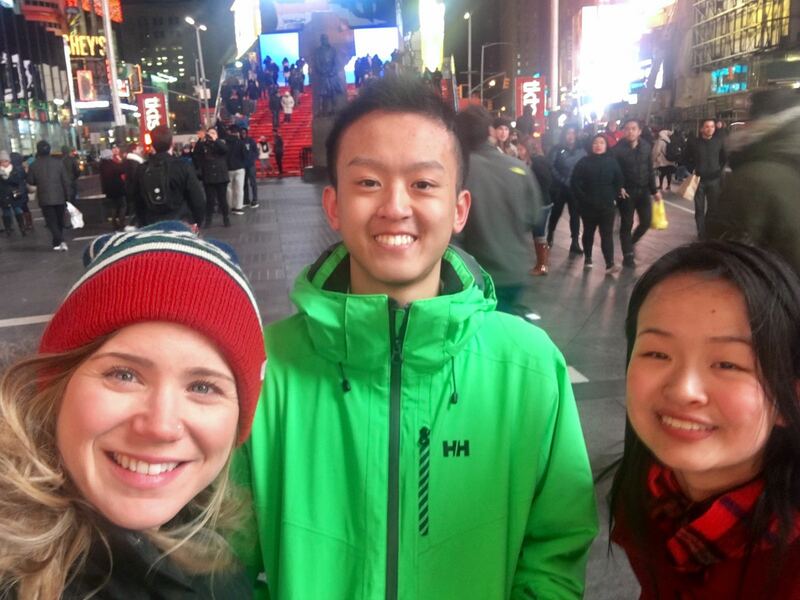 From right: Youth Advisory Council members Christina and Tony with Kate, Special Projects Manager for Plan International Canada. On the last night before we left New York, we visited Times Square. Between the constant stream of taxi horns, the rush of pedestrians, and blinding billboards that towered above us, it seemed that every available space had been claimed and was vying for our attention. In the distance, we could hear the faint melody of a soulful tune: a girl nearby was singing a cappella. There was no instrumental accompaniment and no need for it either. Standing in the middle of Times Square, her voice was strong and pure and powerful. People stopped to listen, and for a few minutes, her song made the windy night a little warmer. Sometimes standing in the middle of the commotion in our daily lives, it is easy to feel insignificant and lost, yet I knew in that moment that we were a part of something profound. Youth are the future, but as we learned at the Youth Forum, we are also the present. Through CSW61 and similar events like the Women in the World Forum, I hope that youth around the world will be inspired to speak out for gender equality and take up space with our voices. One voice can pierce through the commotion and the noise and make a difference. The world needs us now more than ever. Christina Luo is a second-year business student majoring in Strategic Management and Organization at the University of Alberta. As a member of Plan International Canada's Youth Advisory Council, she is passionate about education, health, and economic empowerment. She enjoys tackling problems with an entrepreneurial mindset and believes in including interdisciplinary approaches to poverty alleviation and achieving gender equality.